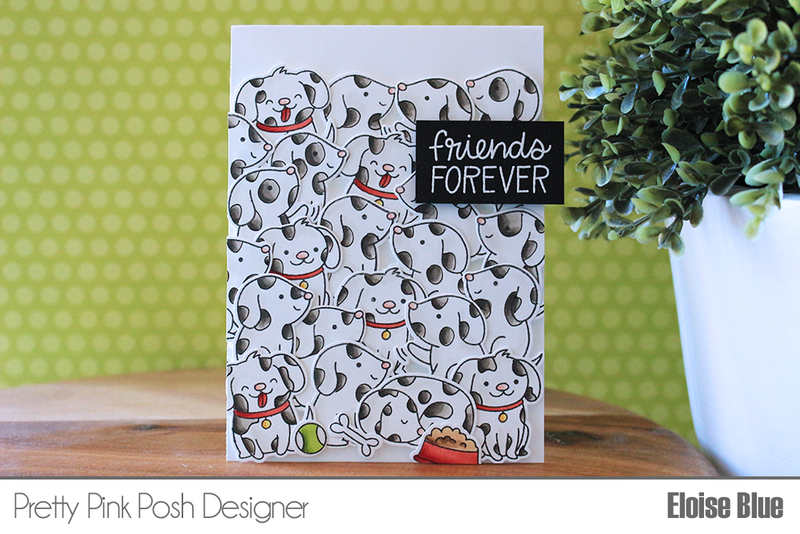 Hi everyone, today I have a card that I made for Pretty Pink Posh, it was supposed to have a video - but half the footage got deleted and so since I liked how the card turned out, I thought I would just post without the video. So for today’s project I’ll be pulling inspiration from a movie to create my card today. Inspiration can come from anywhere. 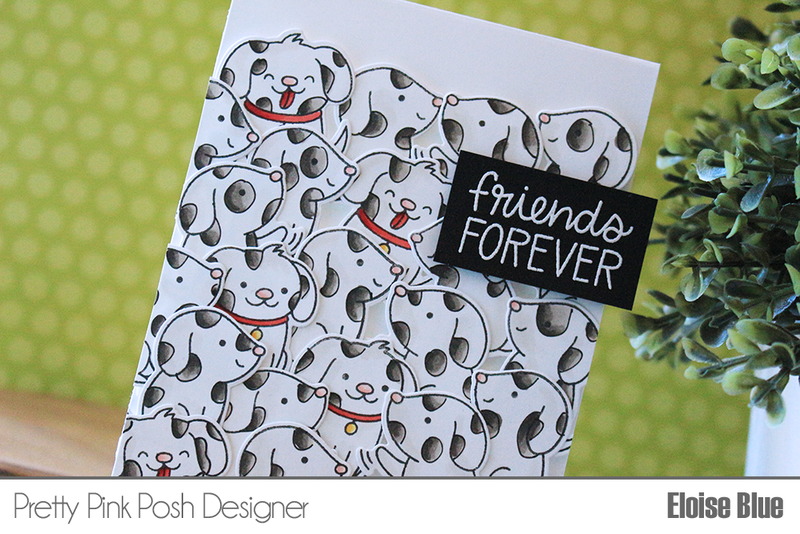 I pull inspiration from other designers, from home décor items, from Pinterest, from a pattern to anything really and so I thought it would be fun to use the new Playful Puppies stamp set to create a cluster of dogs, that look and are coloured like Dalmatians. I love Disney movies and these dogs I think would be just so cute to cluster together and make the huge group of them just like in the movie; 101 Dalmatians. I’ll be using Copic Markers for all my colouring today and also altering my images to make them have spots also. To begin my card today, I started off with stamping a ton of puppy images onto some Neenah Solar White Cardstock. I then used a Copic Multi Liner in 0.3 to draw on the spots. I knew a lot of the puppies would be covered by each other so I made the spots more so on their face to save some time. I then used my Copic Markers to colour them all in and then used the coordinating dies to cut them all out. Originally I thought I would create a one layer panel and mask off all the puppies, but changed my mind in the end as I thought this would be easier in the long run. Next up, all I did was take a white card base and ink blend a little grey at the top, just to give the base some interest. Then, I laid out all my puppy images over lapping each other and created a tall cluster of them to fit over the majority of my card. I then pulled some Press N Seal and placed it over the top to hold them altogether. I added foam tape all along the backs of them and adhered them onto my card base. I then used my scissors to trim off any excess. Now that my card was pretty much complete, I pulled the ‘Best Friends Forever’ sentiment out, masked off the ‘Best’ and white heat embossed the ‘Friends Forever’ onto a strip of black cardstock. I then adhered that over my cluster and my card was complete. I hope you enjoyed my card today and got inspired. I love creating scenes on my cards and re-creating a movie scene today was so much fun. All the supplies I used will be listed and linked down below, thanks so much for stopping by today and I’ll catch you all next time.